DeltaGlass high temperature tape is heat, flame and fire resistant. 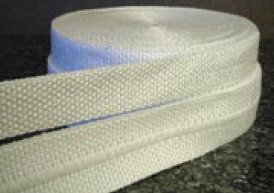 Fiberglass (fibreglass or glass-fibre) woven tapes are fabricated from high quality type E fiberglass that will not burn and will withstand continuous exposure to temperatures of 1200°F / 648°C. Heat Treated / Heat Cleaned tapes offer the benefit of very low smoke-off as most of the organics have been removed in the heat treating - heat cleaning process. This material resists most acids and alkalis and is unaffected by most bleaches and solvents. It is flexible and conformable. For a higher degree of flexibility and conformability, consider using a knitted version of this tape (knitted fiberglass tape). The available thicknesses of stock heat treated / heat cleaned tapes is .100", but any of our tapes can be heat treated / heat cleaned.